The Eastern Conference final, featuring the Lethbridge Hurricanes and Regina Pats, will open at the Brandt Centre in Regina with games on Friday and Saturday nights. Tickets for those games sold out in about 10 minutes on Tuesday. . . . All eyes are on Regina F Adam Brooks, the team captain, who hasn’t taken a shift since injuring a knee in Game 2 of the second-round series with the Swift Current Broncos that ended in Game 7 in Regina on Monday. . . . “I don't know for sure (if he could return)," John Paddock, the Pats’ GM and head coach, told Greg Harder of the Regina Leader-Post on Tuesday. “I’d like to say that I’m hopeful at some time in the series, but that’s me talking. That’s not really (trainer) Greg (Mayer) or the doctors telling me that.” . . . Brooks was in uniform and on the Pats’ bench for the last three games of the series with the Broncos, but he never got on the ice. . . . A prolific scorer, he won the WHL scoring title last season and finished one point behind teammate Sam Steel this season. F Alexander Kuvayev (Lethbridge, Vancouver, 2010-12) has signed a one-year extension with Spartak Moscow (Russia, KHL). This season, he was pointless in 22 games with Spartak; and had seven goals and three assists in 17 games with Khimik Voskresensk (Russia, Vysshaya Liga). On Tuesday, I mentioned ticket scalpers being in evidence prior to Game 7 between the Swift Current Broncos and the Pats in Regina on Monday night. It wasn’t long before I heard from Dan Russell, the former host of the popular Vancouver radio show Sportstalk and a man with considerable experience doing WHL play-by-play. He recalled two instances of seeing scalpers prior to WHL games. The first was in 1984 at Queen’s Park Arena, the home of the New Westminster Bruins. They were playing the Portland Winterhawks and it was Game 9. Yes, Game 9. Russell also recalled seeing scalpers in 2005 when the Vancouver Giants were playing the Kelowna Rockets in Game 6 at the Pacific Coliseum. Finland beat Team Canada 6-3 to conclude round-robin play at the IIHF U-17 World Championship in Poprad, Slovakia, on Tuesday. Finland (4-0-0-0) finished atop Group A, with Canada (2-1-0-1) second. D Jett Woo of the Moose Jaw Warriors had one of Canada’s goals. G Ian Scott of the Prince Albert Raiders gave up five goals on 27 shots before being lifted at 1:24 of the third period. . . . Team Canada will play Sweden (2-0-0-2), the third-place team from Group B, in a Thursday quarterfinal game in Spisska Nova Ves, Slovakia. . . . In another game, D Mark Rubinchik of the Saskatoon Blades had two goals, including the winner, and an assist as Russia got past Czech Republic, 5-4. Rubinchik had six points, including two goals, in four round-robin games. Russia will meet Sweden in a quarterfinal game on Thursday. . . . In the other quarterfinal games, it’ll be Finland against Czech Republic and Team USA vs. Switzerland. The Prince George Cougars have signed F Liam Ryan, who turned 17 on Jan. 2, to a WHL contract. From New Westminster, B.C., he was a seventh-round selection in the 2015 WHL bantam draft. This season, he had 15 goals and 28 assists in 38 games with the Vancouver Northeast Chiefs of the B.C. Major Midget Hockey League. The Vancouver Giants have signed G Jacob Wassermann, ? ?, to a WHL contrct. The 6-foot-5 native of Humboldt, Sask., was an eighth-round selection in the 2015 bantam draft. This season, he played for the midget AAA Saskatoon Blazers, going 10-13-0, 3.23, .902 in 26 games. In five playoff games, he was 1.81, .947. The QMJHL lost its defending champion on Tuesday night as the Chicoutimi Sagueneens bet the host Rouyn-Noranda Huskies, 4-3 in OT, in Game 7 of a second-round series. Chicoutimi, which trailed 3-1 with 10 minutes left in the third period, went into the playoffs as the No. 8 seed; the Huskies were No. 2. . . . The Sagueneens next will face the No. 1 Saint John SeaDogs. . . . The other semifinal will have the No. 4 Charlottetown Islanders up against the No. 5 Blainville-Boisbriand Armada. The Armada beat the visiting Acadie-Bathurst Titan, 7-1, in Game 7 last night. In the OHL, F Warren Foegele scored at 10:40 of OT to give the host Erie Otters a 5-4 victory over the London Knights in Game 7 of their second-round series. The Knights are the defending Memorial Cup champions. . . . The Otters will meet the Owen Sound Attack in the Western Conference final, one that will feature a pair of former WHL coaches. Kris Knoblauch runs the bench for the Otters; Ryan McGill does the same for the Attack. . . . In the Eastern Conference final, it’ll be the Peterborough Petes facing the Mississauga Steelheads. —— There will be a definite WHL flavour to the Manitoba Hockey Hall of Fame’s 2017 inductions on Oct. 7 at Winnipeg’s Canad Inns Polo Park. Included in the Class of 2017 are Murray Bannerman (Winnipeg Clubs, Victoria Cougars, 1973-77), Jim Benzelock (Winnipeg Jets, 1967-68), Laurie Boschman (Brandon Wheat Kings, 1976-79), Pat Falloon (Spokane Chiefs, 1988-91) and Lew Morrison (Flin Flon Bombers, 1967-68), all of whom played in the WHL. Also being inducted will be Rob Martell, a former WHL linesman who went on to a career in the NHL. . . . For more on the complete Class of 2017, check this right here. The Brooks Bandits won their second consecutive AJHL championship on Tuesday, beating the host Whitecourt Wolverines, 4-1, to sweep a best-of-seven final. . . . Brooks has won four championships in the past five seasons — 2012, 2013, 2016 and 2017. . . . This time, Brooks went through the playoffs with only one loss, while outscoring its opposition, 75-16. . . . Brooks had finished the regular-season with the AJHL’s best record — 51-5-4. . . . 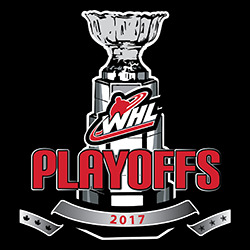 The Bandits now move on to the Western Canada Cup in Penticton, B.C., April 29 through May 7. The five-team tournament will feature the host Penticton Vees, the BCHL’s Chilliwack Chiefs, the Bandits and the champions of the SJHL and MJHL. The top two teams in that tournament will advance to the RBC Cup. The Vees hold a 2-1 lead over Chilliwack, having posted a 5-2 home-ice victory before 3,009 fans last night. They’ll play Game 4 tonight in Penticton. . . . F Massimo Rizzo, taken 15th overall by the Kamloops Blazers in the WHL’s 2016 draft, opened the scoring for the Vees, on a PP, with his first BCHL goal. Rizzo has yet to sign with the Blazers or commit to the NCAA route. If you enjoy stopping off here and would care to make a donation to the cause, please feel free to do so by clicking on the DONATE button and going from there. If you have some information you would like to share or just a general comment, feel free to email me at greggdrinnan@gmail.com. If interested, you also are able to follow me on Twitter at @gdrinnan. 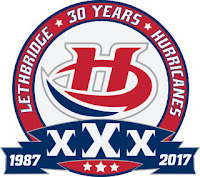 At Medicine Hat, F Tyler Wong scored his second goal of the game, at 3:02 of OT, to give the Lethbridge Hurricanes a 5-4 victory in Game 7 of a second-round series. . . . The Hurricanes are 5-0 in Game 7s in franchise history, with two of those on the road. They now will meet the Regina Pats in the Eastern Conference final. That series will open with games in Regina on Friday and Saturday nights. . . . With the Medicine Hat defenders backing up, Wong skated into the Tigers’ zone and beat G Michael Bullion with a 20-foot wrist shot. . . . Just moments earlier, Lethbridge G Stuart Skinner had made a huge save on Tigers F John Dahlstrom. . . . Wong’s goal sent the Hurricanes into the third round for the first time since 2008. . . . F Zach Fischer (7) had given the Tigers a 1-0 lead at 8:47 of the first period, only to have the Hurricanes score three times before the end of the period. . . . F Jordy Bellerive (4) tied it just nine seconds later. . . . Wong gave the Hurricanes their first lead, at 16:22. . . . F Egor Babenko (7) extended that lead at 19:13, with Wong earning an assist. . . . Medicine Hat went back out front with three goals in the first half of the second period. . . . F Matt Bradley (4) got the Tigers to within a goal at 4:07. . . . F Mark Rassell, who finished with seven goals, then scored twice, at 5:14 and 9:26, to send the home team out front. . . . F Dylan Cozens, a 15-year-old AP, tied it for Lethbridge, with his second goal of the series, at 17:17 of the third period. . . . Cozens also had an assist on Bellerive’s goal. . . . Wong, the captain, won it with his 11th goal of these playoffs. It came 54 seconds after Lethbridge D Brennan Riddle had been sent off for high-sticking. . . . Bellerive added an assist to his goal. . . . Skinner finished with 36 saves, 11 more than Bullion. . . . The Tigers were 1-5 on the PP; the Hurricanes were 0-3. . . . Just like for Game 6, the Hurricanes scratched D Calen Addison, F Matt Alfaro, F Zak Zborosky, F Ryan Vandervlis and F Zane Franklin, all of them regulars. . . . Lethbridge added F Connor Lyons to the lineup, taking out F Jayden Davis. Both are APs. . . . “I am so proud of the team,” Lethbridge GM Peter Anholt told Taking Note, via text, shortly after game’s end. “(Head coach) Brent (Kisio) and the coaches did such an unreal job of keeping the guys focused. Never looked for excuses. Just played. Faced adversity and overcame it. So proud.” . . . The road team won five of the seven games in this series. 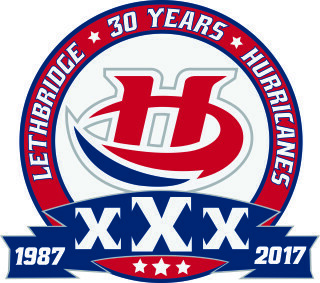 The Hurricanes went into Medicine Hat and won Games 2, 5 and 7. . . . Announced attendance: 5,556.